Now let me start off by saying this… when I told people I was going to Bali, the majority of responses I got were along the lines of: “Where?” “What’s Bali?” “Is that a country?“. So if you’re one of those people, I’ll give you some background so you’re not completely lost. Bali is a 2,200 square mile island in Indonesia. 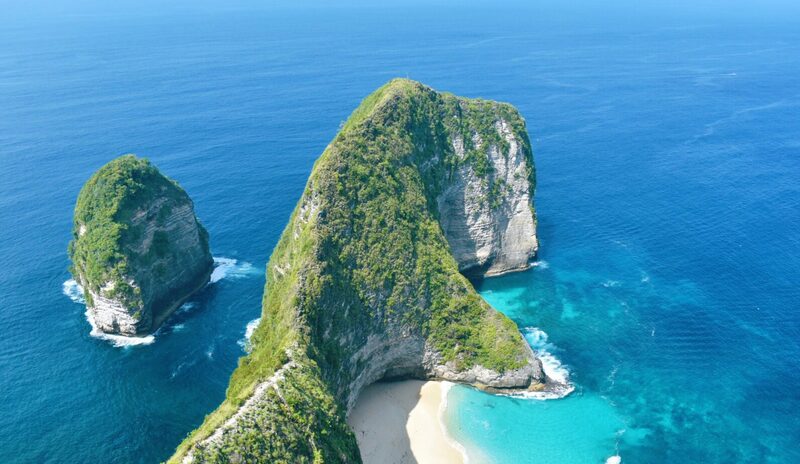 It is composed of the main island and three smaller islands off of its eastern coast – Nusa Lembongan, Nusa Ceningan, and Nusa Penida. It’s geography is quite diverse, consisting of volcanoes, jungles, and beaches with turquoise waters. It. Is. Beautiful. For all of my international flights, I always book to fly out of New York. Whether it’s JFK or Newark, you’re going to save hundreds to even a thousand dollars on airfare. The two hour drive and dealing with New York traffic is worth it. We found an ridiculous deal with China Eastern and got a round trip ticket to Bali from JFK for $450. Yes you read that right FOUR HUNDRED AND FIFTY DOLLARS to fly to the other side of the world and back. Now if you have anxiety with flights this might be an issue with you.. our flight from JFK to Shanghai was 15 hours. Then we had a 12 hour layover in Shanghai. Then 6 hour flight from Shanghai to Despensar (the capital of Bali). The flights are long but China Eastern airlines was actually a lot nicer than we were expecting for such a cheap flight. We had two free checked bags, a personal item, and a carry on. We also got two free meals, a snack, and the in flight entertainment was surprisingly really good. We had a side aisle seat for two and with some niiiiice sleep meds we got a decent amount of sleep. Bali is in Southeast Asia and if you know a thing or two about that area, it’s that its not the most developed part of the world which can increase the risk of disease. Make sure you make an appointment with an infectious disease/travel doctor. You should have a rough itinerary of what you’re going to do and where you are going to stay. When I went, I just got a new tetanus shot since my old one expired and my doctor prescribed me pills to take to keep me immune to typhoid. If you do get anxiety or have trouble sleeping, I would also talk to your primary care doctor about anxiety or sleeping medicine for your flight. Bali is known as the land of a thousand temples. Hindu is the major religion in Bali despite Muslim being the predominate religion in Indonesia. Due to their religion, every house has a temple for worship. And families have family temples. And there are public temples. And sometimes restaurants have temples. And there are temples dedicated to rice fields. And monkeys. And there are temples that have been there for hundreds of years that are now mostly just tourist attractions. There are just A LOT of temples. Bali’s culture is spiritually rooted in their religious beliefs and it was humbling to watch how dedicated they are to those beliefs. If you ever visit Bali, you’ll notice small boxes made out of palms containing flowers, rice, and sometimes even eggs or incense that they put out every morning. These are their “offerings” so try your best not to step on them or knock them over. In addition to a thousand temples, there are also thousands of stray dogs – I’m not over exaggerating. So if you have a faint heart for strays and plan on traveling to Bali, I’m warning you now that you’re going to have a dying urge to bring a dog home. Especially if you see a puppy appear out of no where on the side of the road. They are EVERYWHERE AND THEY WILL BREAK YOUR HEART CAUSE THEY’RE ALL SUCH GOOD BOYS. Bali’s main economy is dedicated to tourism. The majority of tourist come from China and Australia but we met some people from all over the world including Bahrain, India, and South Africa. Many of the Balinese speak basic English but if they don’t they will usually give you a heads up and tell you. Bali is also called the land of a million smiles because these people are some of the happiest people you will ever meet. It is amazing to see how happy they are with how little they have. Which brings me to my next point – Indonesia is not a wealthy country and the U.S. dollar can go a long way in Bali. We spent around $250 each on rooms there for a week that would cost 3 times as much back in the U.S. I’m talking breathtaking views, infinity pools, complimentary breakfasts all for an average of about $35 a night. When we were there I only spent $300 total (this includes a private driver each day, all our food/drinks, excursions, souvenirs, and transportation between the 3 places we stayed) and I could have spent WAY less. Motor scooters are the main way of transportation there and they can be rented for about $5-$7 a day. Private Drivers can cost anywhere from $20-$40 total a day depending on your location and how long you’re going to use them for (You can get a whole driver for a day for the same price as your drunk Uber ride home from the bar). If you plan on seeing a bunch of sights and have a small group I would recommend a driver! If you’re only going to one or two places you’re better off saving money and just renting a taxi. In Bali, they drive on the left side of the road and there’s practically NO rules. We tried to to rent a motor scooter and we almost crashed into a wall and off a bridge within 2 minutes so we sided with a taxi for the day. So if you’re going to rent a motorbike you should have a solid idea how to ride one because the roads are narrow, hilly, busy, and there are little to no lights or stop signs. But the people are SO nice? Our one driver cut a motorbike off and when the motorbike went around us he gave a polite honk and a thumbs up??? I thought what world is this?? That’s another thing, when people honk in Bali its usually for a heads up. Like “hey I’m just honking to let you know I’m passing you” or “hey this is a sharp turn I’m just honking to make sure you know I’m coming from the opposite direction” or “hey this is a really narrow bridge, you should come across first”. THEY’RE SOOOOO NICE. Also, if you rent a motorbike there’s no gas stations unless you’re around the city, Despensar. Instead, you’re going to have to get petrol from little shops on the side of the road. They sell them in bottles but we saw a lot of shops with them so the odds of you running out of gas and being stranded are low. Now here’s an important topic: Money. You’re going to need cash in Bali. Some places will take card but their might be a minimum but everywhere takes cash and its always safe to have for taxis, markets, restaurants, and local shops. If I could do it over again I would order a small amount of Indonesian Rupiah ($50 USD) at least a month before you leave so that you get it in time. This is good to have for when you get there for a taxi from the airport, a quick meal, or anything else you might need upon your arrival. You can check your banks currency exchange rate but I found the lowest rates by ordering currency online through Travelex. When you get there, just take out money from an ATMand save yourself the currency exchange service charge. I would also recommend bringing at least $100 USD just in case your debit card doesn’t work with the ATM. They have a lot of money exchanges there with NO COMMISSION so you can once again save yourself from that exchange service charge. Now to the last topic of discussion – your phone. This got a little complicated so you’ll have to bear with me here. I have AT&T and when I travel international I usually just use their International Day Pass which allows you to use your phone as if you were home and it only cost $10 a day – I did this for our 12 hour layover in Shanghai. The only problem is that AT&T doesn’t offer the Day Pass feature for Indonesia so we decided that we were just going to buy SIM cards when we got there because they’re extremely cheap and they were the next best option. AT&T also has a Passport option which is a one time fee of $60 but you only get 1 GB of data so you can get a lot more for a lot less with the SIM card. The only problem was…. it worked for Megans phone but not mine. We figured out that because Meg bought her phone from Apple she could use different SIM cards but because I bought mine from AT&T it was “locked”. Sure, I could have “unlocked” my phone so I could buy a SIM card but I’m stubborn and I kinda liked the idea of not having my phone when we were out. I could still use iMessage and Facetime when I was on WiFi and I would use Meg’s hotspot if I really needed service. I would highly recommend looking into whats the best option for your phone before you leave! If you made it this far through this post I’m guessing you’re at least THINKING of traveling to Bali and my recommendation is this: GO. It has something for everybody and is SO worth the flight. You could spend less money going to Bali for 10-14 days than you could booking that all inclusive vacation at a mediocre resort in Cancun. Take chances, immerse yourself in different cultures, and try something new.